Nar-Phu trekking is in the Valley of the Nar Khola in Annapurna region Manang district of Nepal. The route leads us as Annapurna circuit trekking till to Koto then follow Nar Khola valley. Nar-phu Valley trekking is one of classical trekking in Nepal. According to Nepal government trekking rules to do trekking in Nar or Phu village need special trekking permit. It was recognized very lately. Who want to explore hidden valley and trek off the beaten crossing through Challenging high passes like Kangla pass (5200m) trekking. Hidden by swirls of mountain mist ahead of us, from Kangla pass at 5200m the magnificent panorama view of Annapurna massif appears remote and forbidding. Our destination is the Nar-Phu trekking, above the tree line on the upper limits of cultivation, in the very north of Manang district. It takes five hours reaching the pass that links Nar with Manang and three other Bhotia villages in the Nyershang down valley. Now day, Nar Phu has about 300 inhabitants who depend on livestock, unlike most Bhotia people, whose trading patterns changed drastically after the Nepali Government closed borders with Tibet. The people of Nar and Phu valley were least affected by this change. This trekking path leading from the valley into Tibet had never made them dependent on the salt trade, and till today yak herding is the basis of their livelihood. Asian Hiking Team; begin Nar-Phu treks from Besi sahar the Lamjung district head quarter 5, 6 hours driving from Kathmandu, now a day the seasonal road head to Syange or Koto 5-7 hours drive, trek 4/5 days to reach Koto on foot. Require special permit entrance from Koto into Nar Phu Valley. 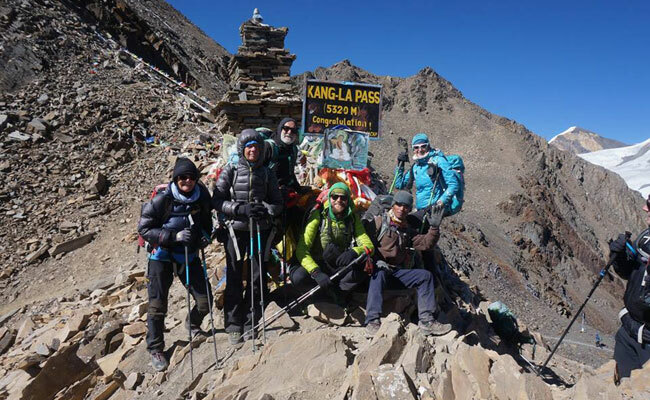 Explore those two villages and cross Kangla pass at 5200m to entry in Manang. 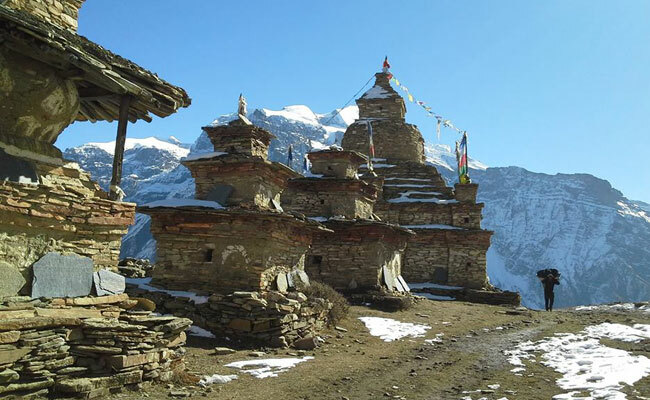 The itineraries bring you Thorong-la pass 5416m and drives or fly from Jomsom to Pokhara. However, it is possible return to Koto and continues to Basi Sahar within 12 days. It is also includes your trek to Tilicho Pass to end trek in Jomsom or continues trekking to Annapurna Base Camp. There are many options so please not hesitate to write us your interest. This trek is possible to operate tea house/Guest house. Nar and Phu trekking special permit fees is US$90 per week per person from Sep to Nov. and US$ 75 per week per person from Dec to Aug. We are arranging all necessary permits, overland transport with friendly staffs and wonderful service for Nar Phu trekking in Nepal. Day 01: Drive from Kathmandu to Besi Sahar (823m. ), 5/6 hours, Overnight at Guest house/Hotel. Day 02: Besi Sahar to Koto takes about 5-7 hours drive by local Jeep, Overnight at Guest house/Hotel. Day 03: Trek from Koto to Meta (3560m) takes about six hours, Overnight at Guest house/Hotel. Day 04: Trek from Meta to Kayang (3887m), Overnight at Guest house/Hotel. Day 05: Trek from Kayang to Phu village (4080m), 4/5 hours, Overnight at Guest house/Hotel. Day 06: Excursion around Phu valley, Overnight at Guest house/Hotel. Day 07: Trek from Phu valley to Kyang (3887m), overnight at hotel/Guest house. Day 08: Trek from Kyang to Naar village (4200m), 6/7 hours, Overnight at Guest house/Hotel. Day 09: Explore Naar village, Overnight at Guest house/Hotel. Day 10: Trek from Naar village to Koto (2600m), 7 - 8 hours, Overnight at Guest house/Hotel. Day 11: Koto to Besi Sahar by Local Jeep, 5-7 hours, overnight Guest house/Hotel. Day 12: Besi Sahar by Jeep and drive to Kathmandu, 4-5 hours drives, overnight Hotel. Day 01: Drive from Kathmandu to Besisahar (823m), 5/6 hours, overnight at Guest house/Hotel. Day 02: Trek from Beshishahar to Jagat (1310m), 5 hours, Overnight at Guest house/Hotel. Day 03: Trek from Jagat (1310m) to Dharapani (1960m. ), 4/5 hours, Overnight at Guest house/Hotel. Day 04: Trek from Dharapani to Koto takes about five hours, overnight at Guest house/Hotel. Day 05: Trek from Koto to Meta (3560m) takes about six hours, Overnight at Guest house/Hotel. Day 06: Trek from Meta to Kayang (3887m), Overnight at Guest house/Hotel. Day 07: Trek from Kayang to Phu village (4080m), 4/5 hours, Overnight at Guest house/Hotel. Day 08: Excursion around Phu valley, Overnight at Guest house/Hotel. Day 09: Trek from Phu valley to Kyang (3887m), overnight at hotel/Guest house. Day 10: Trek from Kyang to Naar village (4200m), 6/7 hours, Overnight at Guest house/Hotel. Day 11: Explore Naar village, Overnight at Guest house/Hotel. Day 12: Trek from Naar village to Ngwal after crossing Kang La pass, 7 11 hours, Overnight at Guest house/Hotel. Day 13: Trek from Ngwal to Manang (3500m), takes about three hours, overnight at Guest house/Hotel. Day 14: Trek from Manang to Yak Kharka (4350m. ), 4 hours, Overnight at Guest house/Hotel. Day 15: Trek from Yak Kharka to Thorong Phedi (4420m. ), Overnight at Guest house/Hotel. Day 16: Trek from Thorung Phedi to Muktinath (3850m.) via Thorong La (5416m), 7 to 12 hours,overnight guest house. Day 17: Trek Muktinath to Jomsom (2740m. ), 5/6 hours, overnight tea house. Day 18: Flight back to Pokhara, 25 min. Or drive to Pokhara by local bus/Jeep, Overnight at Guest house/Hotel. Day 19: Pokhara to Kathmandu by tourist bus/car/van, 200km, 6 hours, Overnight at Hotel. Note: It is possible to drive from Muktinath to Pokhara as well. The itinerary is subject to change as your time and interest. Nar Phu Special trekking Permit. Domestic air Fare (if use flight from Jomsom to Pokhara or Pokhara to Kathmandu). Hot and cold drinks, hot shower, internet, phone etc. You drive along the Kathmandu-Pokhara Highway to Dumre and then follow the narrow and paved road by the Marshyangdi River to Besi sahar, the district headquarters of Lamjung district, 5 hours, Stay overnight at lodge. Day 02: Beshishahar to Koto takes about five yo seven hours driving, overnight Lodge. After breakfast start driving to Koto, there are construction road so drive is slowly. We cross the server Marshyangdi Khola two time. Crossing the Hydro power follow the Marshyangdi river. Crossing the beautiful village of Bulbule, Shangye, Chamche, Tal, Tato Manang than reach to Koto with in 5-7 hours, stay overnight Lodge. You cross the river leading to the Nar Phu valley and hike up through beautiful woods above the Phu Khola. The route takes you through some beautiful woods and past several small caves, and a pilgrims; Dharmasala. After you emerge out of a narrow canyon, the trail actually passes under a wide waterfall just before Dharmasala, from where the woods become thinner and the vistas wider, 5-6 hours, continues walk another hour to reach Meta, Stay overnight in camp/basic tea house. Day 04: Trek from Meta to Kayang (3887m) takes about six and half hours, Overnight at Guest house/Hotel. A steep climb up the valley along a small, scenic river brings you finally to high pastures on a 3,200m plateau. You pass by scenic kharka of Meta, 3560m, a non permanent winter settlement of Nar, where you are likely to share the trail with a few yaks! This morning is one of the loveliest walks in the Himalayas. Stay overnight in camp/basic tea house. Day 05: Trek from Kayang to Phu village (4080m), 4 hours, Overnight at Guest house/Hotel. Dropping steeply down to the river, you trek for a while along the river bank and past the “submarine” rock, passing some small possible campsites along the way. You start to see some of the unique, colorful chortens for which Nar and Phu are famous. You have to walk carefully across a small glacial stream before reaching a larger one with a bridge only half covered with large slabs of slate. Another hour and a half of trekking through scenic canyon and gorges, you reach the Phu gate. This ancient gate provides you with you first view of the three villages of Phu, as well as an old “dzong” and the remains of the two forts, all now in ruins, but impressively situated atop the flat lands before Phu. Stay overnight in camp/basic tea house. You can have interaction with locals and explore the wide valley systems above you. You might walk up the valley to the summer grazing settlement or Kharka at Ngoru, a three hour’s walk past the gompa. Phu itself is an incredibly interesting village and you can observe the villagers spinning their yak and sheep wool and chat. Stay overnight in camp/Basic tea house. Day 07: Trek from Phu to Kyang (3887m), 4 hours trekking, overnight at Guest house/Hotel. After breakfast we start trek same way down to Kyang village which take 4 hours, easy day, if everything fine you can continues trek to Naar phedi as well, overnight at hotel/Guest house. Day 08: Trek from Phu to Naar, 4-5 hours trekking, overnight at Guest house/Hotel. You trek down the old bridge spanning a deep, contoured and narrow gorge and all the way back up again. The scenery is stunning. Below you sit Gyalbu Kumbu, built in 1650, and Satte Gompa, both empty. You finally reach the Nar gates at the top of the hill, and pass by yet another line of wonderfully painted, bamboo topped Chortens before turning the corner and being rewarded with sublime views of Nar, the undulating patterns of the surrounding barley and mustard fields, four old colorful and traditional Gompas and the snow peaks looming overhead. Stay overnight in camp/basic tea house. Naar is bit more social and lively than Phu, explore around, Stay overnight in Lodge. Day 10: Trek from Naar village to Koto, 6-7 hours, overnight in Guest house. After breakfast we trek all the way down trekking follow the Nar Khola. It is same way return to Koto, it takes 6-7 hours to reach Koto, overnight in Guest house. Day 11: Koto to Besi Sahar, 5-7 hours, overnight Guest house. All the way same as before, its takes 5-7 hours driving, overnight at guest house. Day 12: Besi Sahar to Kathmandu drive by bus, 4-6 hours drives, overnight Hotel. After breakfast, drive by local bus or private Car to Kathmandu, it takes 5-7 hours drive. We follow the Prithivi highway. If you are interest to visit Pokhara, we can drive to Pokhara too. Besi Sahar to Pokhara takes 3-5 hours. transfer to hotel, Overnight at hotel in Kathmandu. Day 02: Trek from Beshishahar to Jagat (1310m.) takes about six hours, Overnight at Guest house/Hotel. 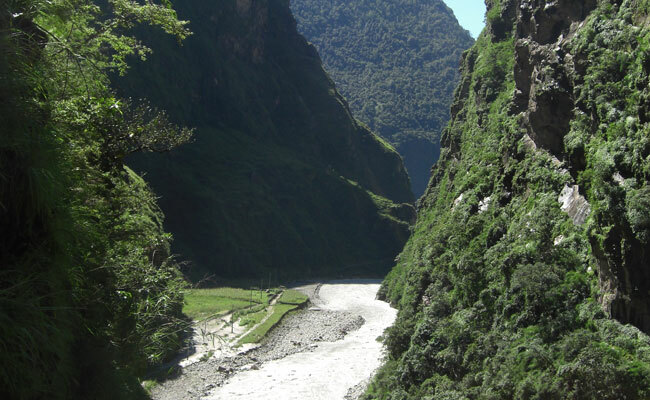 The first part of the trail passes on a flat level along the bank of the Marshyangdi River. You can enjoy the sceneries and the local culture of Gurung community. Cross the river after Nagdi than continues follow the road bring you Syange (1100m.) where there is a beautiful waterfall above and along the river for some distance. The trail then climbs steeply and the path is cut into the sheer cliff-face some 200-300m above the riverbed. The trail then begins to observe small ups and downs to Chamje through the forests. Stay overnight at lodge. Day 03: Trek from Jagat (1310m.) to Dharapani (1960m.) takes about six hours, Overnight at Guest house/Hotel. The first part of the trail descends to the river and after crossing a suspension bridge, you begin a climb to Sattale (1550m.) on a path so steep that it seems one slip would send you hurtling down into the valley. You continue on an undulating path above the river. Climbing the zigzag path to the top of the hill, you see the level, plain of Tal (1700m.). Descend to a grassy riverbank that leads to Tal with its hotels and tea houses. Here you can enjoy the exhilarating waterfalls. Beyond Tal, the valley narrows and the path becomes high and winding and in several areas hew from the rock itself. Beyond the small village of Karte (1900m. ), there is a bit more cliff-walking before the path drops again to the river. You cross a suspension bridge and climb the short distance to the stone Mani marking the entrance to Dharapani (1960m. ), Stay overnight at lodge. Day 04: Trek from Dharapani to Koto (2600m) takes about five hours, Overnight at Guest house/Hotel. You trek a gradually ascending path and cross a stream to reach Koto. The mountain views you can enjoy are of Annapurna II, Manaslu range and beautiful views of forests on the way add another dimension to your trek. Koto is a small village mainly inhabited by Gurung and others whose lifestyles are mainly influenced by Buddhist Tibetans. Stay overnight Lodge. Day 06: Trek from Meta to Kayang (3887m) takes about six and half hours, Overnight at Guest house/Hotel. Day 07: Trek from Kayang to Phu village (4080m), 4 hours, Overnight at Guest house/Hotel. Day 09: Trek from Phu to Kyang (3887m), 4 hours trekking, Overnight at Guest house/Hotel. Day 10: Trek from Kyang to Naar (4200m) 4-5 hours trekking, Overnight at Guest house/Hotel. You trek down the old bridge spanning a deep, contoured and narrow gorge and all the way back up again. The scenery is stunning. Below you sit Gyalbu Kumbu, built in 1650, and Satte Gompa, both empty. You finally reach the Nar gates at the top of the hill, and pass by yet another line of wonderfully painted, bamboo topped Chortens before turning the corner and being rewarded with sublime views of Nar, the undulating patterns of the surrounding barley and mustard fields, four old colorful and traditional Gompas and the snow peaks looming overhead. Stay overnight in Guesthouse. Day 12: Trek from Naar village to Ngwal (3360m) after crossing Kang La pass (5320m) 7 -11 hours, Overnight at Guest house/Hotel. The Kang La is not a difficult pass, but it could be a long day if there is snow. The Kang La, at 5240m, is an absolutely spectacular pass looking over Annapurna II, Gangapurna, Tilicho peak, the peaks surrounding Tilicho and the airport at Hongde. The trail down is steep and then gradually down towards the end. Ngawal, on the upper Pisang route of the Annapurna circuit (up routes of Annapurna circuit), can be reached in as little as two hours from the pass, but the walk down is so nice that you will take it easy and enjoy the views. 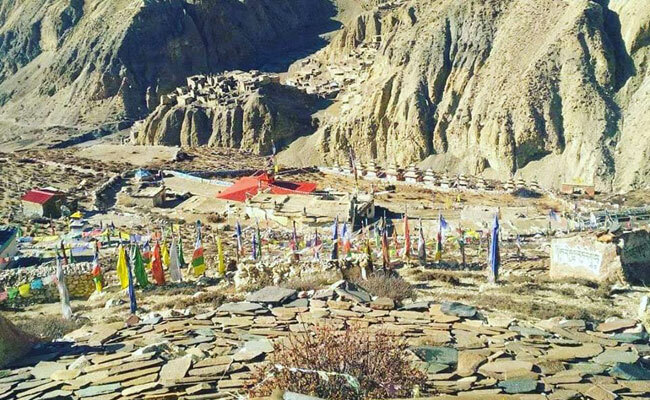 Just before Ngawal is an unusual grouping of chortens and prayer flags, and marks a meditation cave far up in the hills. Ngawal is a wonderful, old village of cobbled streets, prayer wheels and beautiful architecture, obviously a hub of religious activity in previous times. Stay overnight in camp/basic tea house. 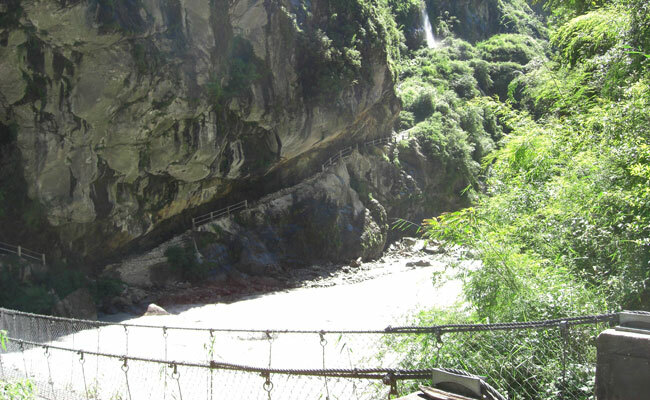 This day you walk on a leveled path along the bank of the Marshyangdi River to reach Manang. On the way you pass pine forests, villages such as Braga and farming terraces. You can enjoy the views of Annapurna range, Tilicho Mountain and beautiful landscapes. Manang is a small town. Stay overnight in lodge. Day 14: Trek from Manang to Yak Kharka (4200m), 3-4 hours, Overnight at Guest house/Hotel. Day 15: Trek from Yak Kharka to Thorong Phedi (4420m.) which takes about 3 and half hours, Overnight at Guest house/Hotel. Leaving Yak Kharka, you climb gradually to a ridge before descending to the headwaters of the Marshyangdi and crossing via a covered wooden bridge. After a short ascent up the mountain path on the right bank, you follow a narrow trail across an unstable spree slope and then descend to Thorung Phedi. Stay overnight at lodge. Day 16: Trek from Thorong Phedi to Muktinath (3850m.) via Thorong La (5416m.) Pass takes about seven to ten hours, Overnight at Guest house/Hotel. The trail becomes steep immediately on leaving camp but as this trail has been used by local people for hundreds of years the path is well defined. The gradient then eases and after around 4 hours of steady climbing you reaches the chorten and prayer flags of the pass. The views are dramatic to say the least, from the snow-covered mountains above, to the head of the Kali Gandaki valley below and the brown and purple hills of Mustang which are spread out before us. The descent to Muktinath is a knee pounding 1600m but it's compensated for with excellent views of Dhaulagiri. Eventually the moraines give way to grassy slopes before a pleasant walk along the Jhong Khola Valley to Muktinath and its shrines and temple. Stay overnight at lodge. Day 17: Trek Muktinath to Jomsom (2740m.) and it takes about approximately six hours, Overnight at Guest house/Hotel. You now begin the descent down the dramatic Kali Gandaki Gorge, initially through arid country in the same geographical and climatic zone as Tibet. After passing through Jharkot and Khingar villages with typical Tibetan architecture, you follow the valley floor most of the way to Jomsom which is sprawled along both banks of the Kali Gandaki. Stay overnight at lodge. Day 18: Flight back to Pokhara, Sightseeing in Pokhara, overnight Hotel. After breakfast we drop to jomsom airport flight to Pokhara, 25 minutes. Pokhara is the famous tourist city, there is many activities for a day trip, either you can sightseeing around Lake, water fall or visit international museum, Cave etc. Overnight in Pokhara at hotel. Day 19: Pokhara to Kathmandu by tourist bus/car/van, 6 hours drives, Overnight at Guest house/Hotel. Drive from Pokhara to Kathmandu by tourist mini bus that takes about seven hours. While driving from Pokhara to Kathmandu, you head up to Damauli, Dumre, Muglin and Kurintar where Nepal's first Cable car is operated to reach to Manakamana Temple. En route, you could enjoy the mountain views, green scenarios, rice terrace fields, vegetable fields and people engaged in their daily life activities. From Naubishe you climb up to Thankot, the gateway to capital city. You can also fly from Pokhara to Kathmandu which takes about 25 minutes.